Steamroller at work near Canberra Times office with road workers spreading gravel. Steamroller spraying tar near Canberra Times office with roadworkers and dray. 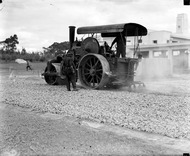 Steamroller fitted with tar spray at work, Mort Street, Canberra City. Horse and dray. Steamroller spraying tar in Mort Street, Canberra City. 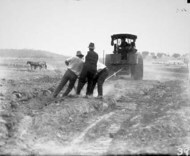 Road works in Mort Street, Canberra City with steamroller and workmen spreading gravel. Road making in Mort Street, south from Canberra Times Office. Civic Centre buildings in the background. Steamroller at work in Mort Street, Canberra City with Civic Centre buildings in background. 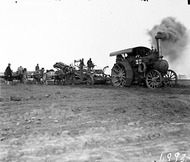 Traction engine towing a road grader loading a wagon drawn by horses. Traction engine towing a road grader loading a wagon hauled by a Cletrac crawler tractor. 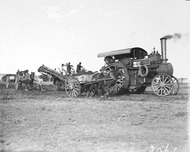 Traction engine towing a road grader loading a wagon and wagons drawn by horses. 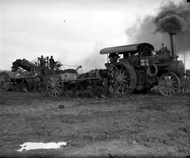 Traction engine towing a road grader loading wagons. 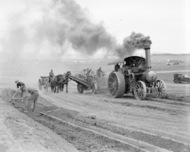 Traction engine towing a road grader loading a wagon drawn by horses building a road.